Heat up the vegetable oil in a saucepan. Once it’s hot, add the rice and lentils, mix well. Fry for a few minutes, stirring constantly. Add the meat and mix well. Fry the egg in a separate pan. Once everything is ready you can serve it all together. You can add the raw egg to the rice mixture and let everything cook together. You can add plantains, arepas, and/or avocados as side. The portions will depend on how many ingredients you add to the mixture. 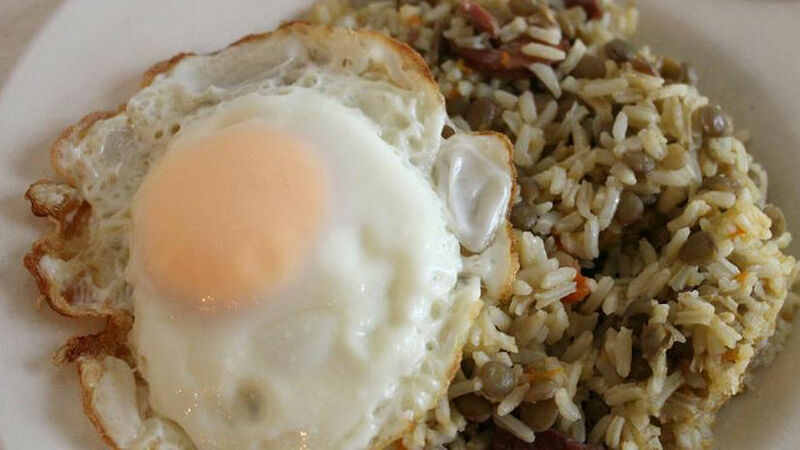 Calentado is one of the most traditional breakfasts you can find in Colombia. It’s so versatile that there isn’t one single universal recipe, but what all its variations have in common are the ingredients because they tend to come from the leftovers of other meals. This dish is so popular that it can be eaten at any time of day, especially for breakfast. I recommend adding a fried egg on the side. To take advantage of the lucky New Year’s lentils that you might have leftover, you can also prepare a delicious breakfast to start the year off right: lentil calentado! Enjoy!